It seems every new platform requires a new set of skills that I need to learn. I work my day job come home rack my brain in front of the computer and still try to be a husband and a father… All I Want for Christmas Is to shorten the learning curve. This post appeared in a group of content developers in a thread that discussed utilizing social to get more viewers and subscribers to a YouTube channel so it can become effectively monetized. The truth is that yes, every new platform requires a new set of skills. Often new platforms don’t try to entirely rebuild the usability of the service but build on what I like to call the Adobe Usability. Adobe software is built in a way that from tool to tool, there are a set of standards, making it easier to pick up one thing if you know another. If you learn all the tools in Photoshop, you can open Premiere and understand a decent percentage of what you can do in that software, just based on the fact that it works and looks the same as the software you’re already familiar with. Many new platforms attempt to make it easier for people to learn by using what’s already been in play. However, not all do. Take Snapchat for example; by nature the app had to be different as there wasn’t anything the same at the time, but they designed an interface so different than anything else out there, people had to often rely on tutorials and websites to learn how to navigate through the app. It can be overwhelming, especially to someone who is only a visitor to this side of the coin instead of someone who rides the tumultuous waves full time. Even those of us who are entrenched in it constantly have to often struggle to keep up. The second you stop and simply rely on what you already know is the moment you are at risk for being left behind in a race in which you may never catch back up. Thankfully once you have a grasp of the basics of the social aspect of social media, it simply becomes a question of learning the products and platforms available while keeping on top of trends, slang and what type of content does best on which of these platforms, which helps some in alleviating the stresses. As 2017 crests over the horizon, there seems to be a hint of automation looming in a hazy cloud. I’m not talking about scheduled posting or even marketing automation software platforms (which is an area that I will expand on at a later time since it ties into the whole marketing vs. sales aspect I see shifting in the near future), but things like chatbots for customer service. 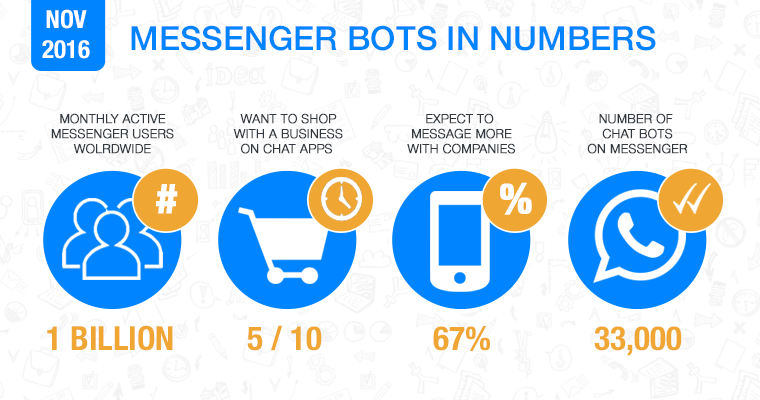 Since being announced in April that third parties can use the (Facebook) Messenger platform to create their own chatbots, their popularity has rapidly grown. Customers want fast turnaround times on their questions and comments which is where the usefulness of a chatbot comes into play. They can be taught to answer most questions from your customer base. (Notice I prefer to use the term ‘taught’ as opposed to ‘programmed.’) Improved real-time engagement is a big goal that I see staying at the top of the list for 2017. So you have AI tools available, but what about what came before that? What about humans? Specifically, what about humans you can’t control? Sure, your team works hard to put forth a very specific message, tone and voice for your brand, but you have to deal with those who do not have that same end goal. One thing you can try is turning the fans into influencers. Now, I attend a lot of comic book conventions. They can become incredibly crowded, impossibly loud and your attention is being pulled in many directions by both booths as well as individuals. I’ve lately started to realize that the world of social is the same way. You have booths (brands). You have booth advertisers on the floor trying to lure people to your table (influencers). You have cosplayers walking around passively waiting for someone to take their picture (individuals). They’re all competing for your attention, some of them working in tandem. Being seen and having your message heard in this crush of information is hard and it’s getting harder by the day. Gone are the days of organic social traffic. Now you have to invest in a stepladder, megaphone and giant TV to get even a second glance. In social terms, this is the equivalent of paying the gatekeepers of our information. Social media has started firmly on the path of being just another paid media outlet. There’s too little space for the amount of content. The ones making waves still tend to be the big established names who got in early with a solid team and an advertising budget. Woah, wait, back up. What’s all this about trust? Why wouldn’t someone trust my brand? Why wouldn’t someone trust my message? Why wouldn’t someone trust me? Well, the honest truth is that for the few messages that actually break through to most people, the audience is going to assume it’s marketing and therefore unreliable information. It’s designed to sell things to you, after all. There are a few ways to combat that, however. I won’t go into all of them in this post since the subject of building trust is a long and varied topic, but I’ve found one format that seems to help tremendously and that is livestreaming. With platforms such as Vine and Periscope and Facebook Live, the public was introduced to an easy format for anyone to pick up a smartphone and open glimpses of their lives to the world. While the popularity of specific apps has waned over time, the act of streaming a live video feed has not wavered. It gives a sense of authenticity and sincerity to see a person interact with the audience and instills a sense of transparency that goes far in building a sense of trust. Plus it’s a great free(-ish) commercial! If you are, for example, marketing an event and you have a special musical guest, see if they would be willing to livestream on your network. Have them play a song or even a clip of one, then say how excited they are to attend this event you have coming up. Ride the coattails of their followers to gain a bigger outreach. In return, you give them access to all of your followers. This is just one way you can use livestreaming to market. Have someone from customer service pop on to stream a Q&A of some questions that are more specific than the FAQ covers. Questions about date cutoffs for orders to be delivered by Christmas? Shipping questions? Cover it all in a special quick Q&A stream that can be replayed on your website and social channels. Show off a new logo or tease a new prototype. Video is the most engaging outlet so utilize it! So what are you looking forward to or dreading when it comes to the state of social in 2017? What things are you looking to embrace and what stale things are you going to escape from? Let’s reinvent our takes on social together!